If you are looking for an inexpensive remodel of your kitchen, consider using RTA Cabinets! Unlike pre-assembled cabinets, RTA is only a fraction of the cost and much easier to construct in a shorter window of time. Using these cabinets is an easy way to increase your home value with very little effort. RTA, Ready To Assemble, Cabinets are an amazing choice for the experienced contractor or the newly discovered home handy-man! They are a great choice for a fresh remodel instead of a total kitchen demolition. Are you looking for a chic way to revitalize your cabinetry? Consider getting mullion doors. Mullions are wooden moldings that divide a frame door opening to hold individual panes of glass. By using a mullion pattern on your cabinet doors, you can enhance the articulate beauty of the wooden and inside glassware or china of the cabinet. By inputting a mullion frame on the RTA cabinetry, you can harbor amazing custom cabinets that your house guests will fawn over. Here at Arkansas Wood Doors, we recommend using RTA cabinets for a multitude of reasons. Firstly, if you are a creative soul, RTA cabinets are more customizable than your average store-bought pre-made cabinets. This allows your vision of the perfect kitchen to come to life. And with the mullion facing, your creativity will be front and foremost on anyone’s mind. Next is the construction time. Because the cabinets are ready to be assembled, the construction will require less time to complete. Generally speaking, pre-made cabinets takes a few months to produce and install. 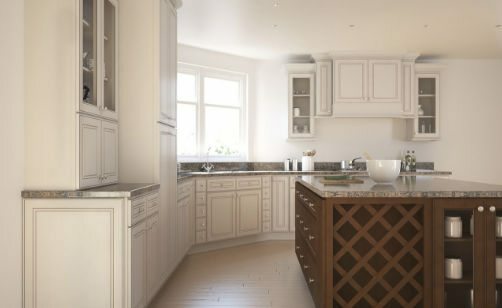 With RTA cabinets, it only takes a couple of weeks to produce and install. Therefore, you can get into your kitchen sooner rather than later! Also, the lower cost allows you to make renovations to the rest of your house instead of just the kitchen! Why Go Through Arkansas Wood Doors? Arkansas Wood Doors is a family-run business and has been for the past four decades. Here at Arkansas Wood Doors, we make custom cabinets for customers all over the USA. Furthermore, we are dedicated to making the cabinets of your dreams. Also, we guarantee top-quality cabinets unlike the cheaply made products from other manufacturers. Unlike our competition, we stand by our company and the quality of work that we produce here. If you want to learn more about our top-quality RTA custom cabinets, feel free to contact us through email at [email protected] or call us today at (479) 968-5486! Receive your free quote today and become a part of the family!